"I'd rather spend one year as a tiger than a hundred years as a sheep." 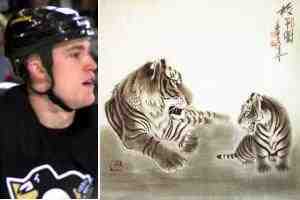 This is Penguin Andrew Ference's motto du jour; and he has the Chinese character for "tiger" written on his stick. It seems to have proven successful, as he played a big role in sending his team on to the Eastern finals. View tigers and other Chinese paintings (and download nice wallpaper) at The Gallery of China.